The weather has certainly been screwy lately. Normally, the end of April through the entire month of May (and most of June) is as dry as a bone, but this week we've had downpours here in Phoenix. Any other time I'd be doing a happy dance for the rain, but not when our huge cactus is listing to one side like the Leaning Tower of Pisa. The cactus doctor can't come straighten it until the ground drys out. Yikes! I could also have used a crystal ball this week. There were three Poisoned Pen events that I wanted to attend: Greg Iles, Ellen Crosby, and the Death on Demand Party for Carolyn Hart on Saturday. Well... when it was time to leave for Greg Iles, Casa Kittling was being deluged with rain. Not feeling my best, and not trusting my fellow desert dwellers to drive properly in this rare precipitation, I opted to stay home. "It will be on Livestream." Yeah. After ten minutes the author wanted to say whatever he felt like saying without going on any sort of record. Granted I wouldn't've been able to share everything with y'all if I had gone, but at least I would have been in the loop! Ellen Crosby was suffering from a Dominican Republic stomach bug and was so ill that she could barely sign our books, which was a shame, and I hope she recovers quickly. That leaves the Death on Demand Party. I'm keeping my fingers crossed. In the mean time, I thought I would share one of my taken-while-sitting-in-the-pool photos with you. 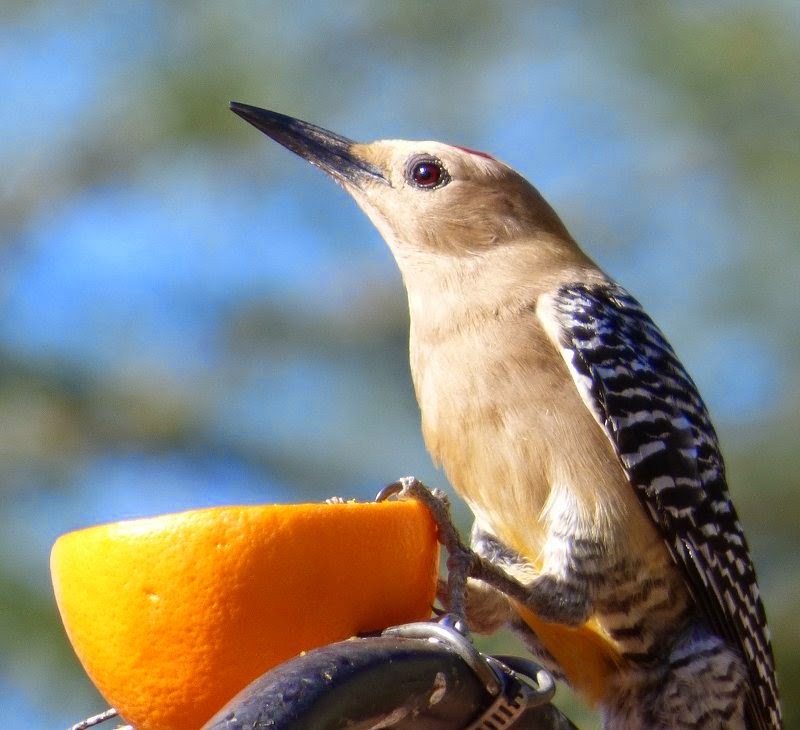 Adult birds are being driven crazy by their young, and they appreciate the free oranges we provide. Which reminds me, I need to add that to my grocery list! 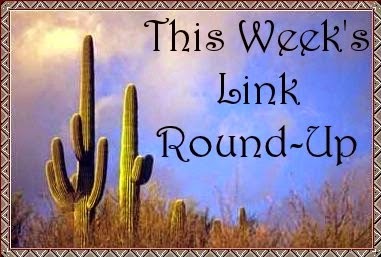 Here are this week's links. I hope you enjoy! Buenos Aires, Argentina just might be the world capital of bookstores. The public will soon be able to see a rare Dylan Thomas notebook which had lain forgotten for decades. Obama has chosen Chicago to host his presidential library. Harper Lee has started a non-profit to keep the To Kill a Mockingbird play in her hometown of Monroeville, Alabama. Viola Davis will be starring in an HBO movie about Harriet Tubman. President Obama has a plan to give low income children access to 10,000 eBooks. One person calls the plan flawed, while another comes right out and says it's not going to work. The two make some valid points. In the mean time other organizations are working hard to put physical books in these children's hands. Netflix will be doing a TV adaptation of Dr. Seuss' Green Eggs and Ham. Has Jane Austen's real Mr. Darcy been found? Judging a book by its spine. Masterful crime writer Ruth Rendell has died at the age of 85. The Nazca Line geoglyphs in Peru formed an ancient pilgrimage route. Picasso's Women of Algiers could become the most expensive painting sold at auction. Urban planning isn't a modern idea; at least one ancient Mayan city was built on a grid. An undersea volcano may be erupting off the northwest coast of the U.S.
Cremated bones in a cooking pot that were found during the construction of the Crossrail in London may date from Boudicca's rebellion. Finnish archaeologists have found the wreck of a fifteenth-century ship laden with $56 million in treasure. Yikes! It doesn't pay to do sloppy work. There will be an investigation over some ruined Roman mosaics in Turkey. Archaeologists have found the 4,500-year-old statue of a little known Egyptian king. I'd love to go for a ride in this 1925 Yellowstone Park bus. I've seen a few of these 7 breathtaking natural cloud formations. How about you? Architectural Digest has compiled the latest list of the most beautiful bookstores. The world's 15 weirdest bridges. 26 books from around the world that you need to read before you die. The 10 best T.S. Eliot poems. I've got just the place for this Nettlestone Library ensemble. The very first thought I had when seeing these fabulous fairytale book covers was "Harry Potter!" That's all for now. Don't forget to stop by next Friday when I'll be sharing a freshly selected batch of links for your surfing pleasure. Oh, Cathy, that's so annoying that you couldn't really experience the PP event as you'd wanted. But I'd have made the same choice not to take that ride under those circumstances. I'm happy you got some rain, but I hope your cactus doctor can fix everything soon. In the meantime...off to plunge into your links! Thanks for them. Cactus doctor postponed till Sunday... and rain forecast for Saturday. And the cactus is leaning even more. This is turning into a nail biter! Hmmm...we've been about to wash away here too. However, our lakes are so grateful. It's been quite a few years. So sad that you couldn't go see Greg Iles. I wish he was appearing here in Austin. And I thought the same thing - I'll just go over to the PP website and see if his event went Livestream. Well, now I wonder what he said! Natchez Burning was full of conspiracy stuff and though I haven't read The Bone Tree yet, I bet it is too. Hope you can get to tomorrow's event for Carolyn Hart. And pictures, please!! I am amazed at those book covers that made you think of Harry Potter. Weren't they just 'wow'? I went and looked on Etsy, but yowza - expensive. I really don't mind the rain, but I wish there were a cone of dryness around our cactus! Yes, those book covers are just WOW, but my money will be spent in Scotland instead this year. Ah well. Gregory the woodpecker is gorgeous! We've just got the red-headed ones here. Here's hoping the cactus stays upright until rescue can arrive. We have red-headed ones here, but they're up in the mountains where it's cooler. Greg does have a splash of red on top of his noggin though.